If you want to sell your home in Natomas California it is important to know what the real estate market is doing. If you want to buy your home in Natomas it is also important to know what the real estate market is doing. 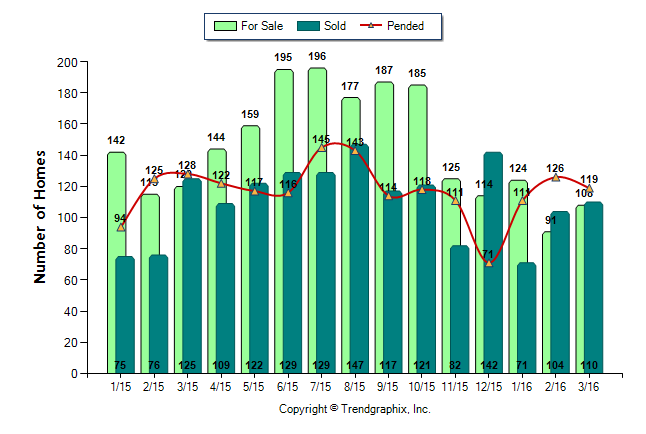 March 2016 is a Seller’s market in the community of Natomas! The number of for sale listings was down 10% from one year earlier and up 18.7% from the previous month. The number of sold listings decreased 12% year over year and increased 5.8% month over month. The number of under contract listings was down 5.6% compared to the previous month and down 7% compared to the previous year. The Months of Inventory based on Closed Sales is 1, the same as the previous year. The Average Sold Price per Square Footage was up 4.8% compared to the previous month and up 9.3% compared to last year. The Median Sold Price decreased by 2.3% from last month. The Average Sold Price also decreased by 4.3% from last month. Based on the 6 month trend, the Average Sold Price trend is “Depreciating” and the Median Sold Price trend is “Neutral”. The Average Days on Market showed a neutral trend, an increase of 6.7% compared to the previous year. The ratio of Sold Price vs. Original List Price is 100%, was the same compared to the previous year. There is much more info in the full FREE market report. 0 Responses on "Natomas homes market report March 2016"